Two months later, you will notice that the situation has not changed, at all. The same extensions are offered in Windows Store, and not a single new one has been added to the list in the meantime. Additionally, it is quite difficult to open the extensions page when browsing the Store. 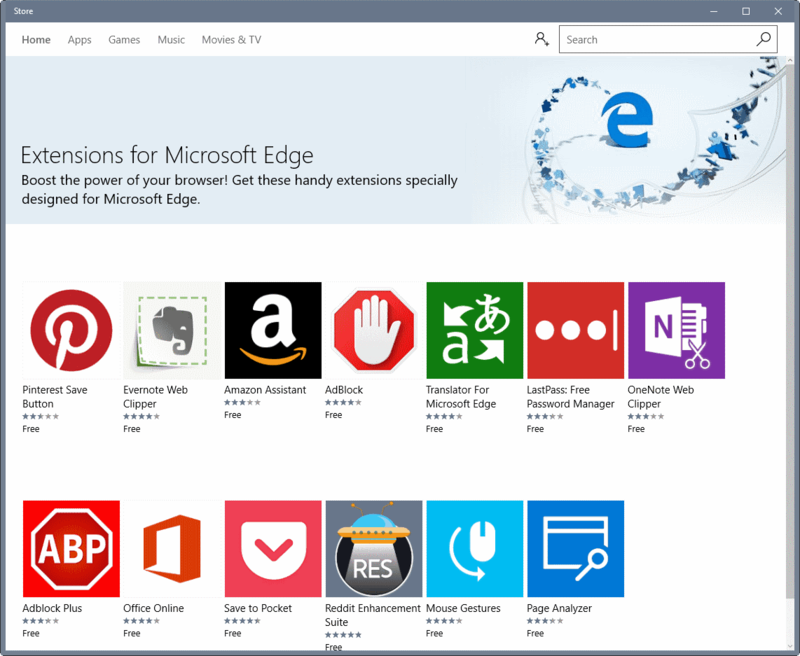 The most reliable way of getting there is to open Edge, select Menu > Extensions > Get Extensions from the Store. Why are not there more Microsoft Edge extensions? If you check the existing extensions, you will notice that they are either created directly by Microsoft, or created by partners that Microsoft worked with during development. The main reason why not a single new extension has been added to the list since the release of the Anniversary Update is that the process of publishing extensions to Windows Store is not ready yet. Microsoft did not reveal information on when it is going to allow extension developers to push their extensions to Store. While that is the main reason why there are not more extensions for Edge available, other factors may play a role as well. We don’t know how many developers have started to develop extensions for Edge. It seems likely that the bulk plans to port existing extensions to Edge, but there is no data on that at all. It makes sense for developers to publish their extensions for Edge. Assuming that Edge got a market share of 5% or so, it is the third largest browser user-wise that supports extensions (after Google Chrome and Firefox). At least some extensions are listed in Store but not yet available. This is true for Turn Off the Lights for Microsoft Edge for instance, which has a store listing but is not yet available for download. It is likely that those extensions are created by partners as well. The gates are not open yet for all developers. It seems likely that extensions will see a big increase if Microsoft will open up the Store for all extension developers. It won’t come anywhere near the numbers of Firefox or Chrome though, and it seems unlikely that these levels will be reached. What is likely going to happen though is that the most popular extensions will become available for Edge eventually (either as a direct port, or a third-party extension that mimics the functionality). This entry was posted on Tuesday, September 27th, 2016 at 10:25 am	and is filed under General News. You can follow any responses to this entry through the RSS 2.0 feed. Both comments and pings are currently closed.